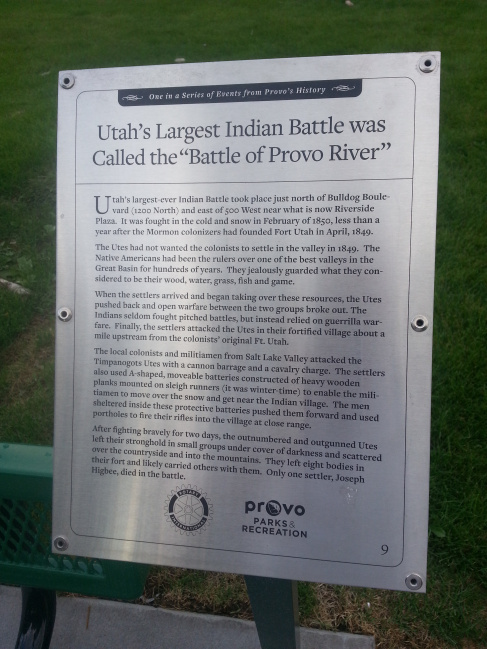 Utah’s largest-ever Indian Battle took place just north of Bulldog Boulevard (1200 North) and east of 500 West near what is now Riverside Plaza. It was fought in the cold and snow in February of 1850, less than a year after the Mormon colonizers had founded Fort Utah in April, 1849. The Utes had not wanted the colonists to settle in the valley in 1849. The native Americans had been the rulers over one of the best valleys in the Great Basin for hundreds of years. They jealously guarded what they considered to be their wood, water, grass, fish and game. When the settlers arrived and began taking over these resources, the Utes pushed back and open warfare between the two groups broke out. The Indians seldom fought pitched battles but instead relied on guerrilla warfare. Finally, the settlers attached the Utes in their fortified village about a mile upstream from the colonists’ original Ft. Utah. The local colonists and militiamen from Salt Lake valley attached the Timanogots Utes with a cannon barrage and a cavalry charge. The settlers also used A-shaped, moveable batteries constructed of heavy wooden planks mounted on sleigh runners (it was winter time) to enable the militiamen to move over the snow and get near the Indian village. The men sheltered inside these protective batteries pushed themselves forward and used portholes to fire their rifles into the village at close range. After fighting bravely for two days, the outnumbered and outgunned Utes left their stronghold in small groups under cover of darkness and scattered over the countryside and into the mountains. They left eight bodies in their fort and likely carried others with them. Only one settler, Joseph Higbee, died in the battle. This marker is #9 in a series, see the others on this page.